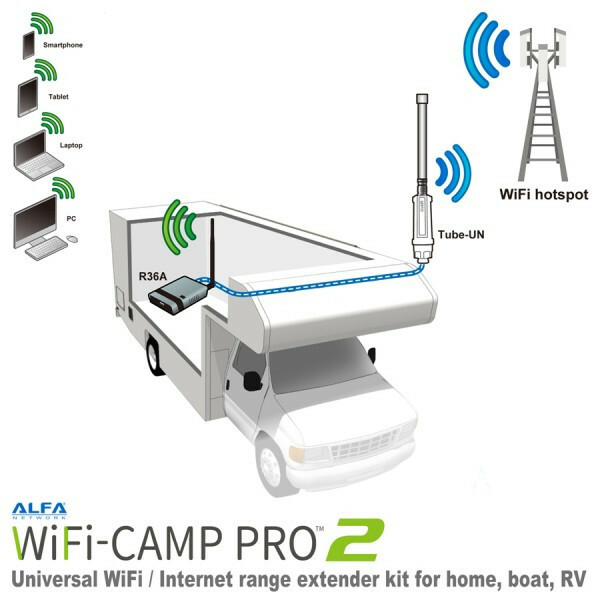 The Alfa Network CampPro2 Wifi set is a complete Wi-Fi solution for use at the camping or in motorhomes, mobile home or yachts (when in the harbour). The WiFi-Camp Pro2 wifi extender & router are the sequential of the very populair WiFi-Camp Pro of manufacturer Alfa Network and is 2x as fast! This set is very handy when the available WiFi signal at location is very weak. For instance during holidays at the camping or in the harbour. The Alfa Network CampPro2 Wifi set allows to receive this signal. The wifi-extender and router receives the internet signal offerd by the camping or hotspot and distributes this via it's own powerfull router. You create your own WiFi zone around your motorhome, mobile home or yacht in this way. The new R36A router (802.11n ) in the WiFi-Camp Pro2 set has a double bandwidth compared to its succesor: up to 300 Mbps. Perfect for instance to provide various users and devices acces to internet to stream audio and video. The WiFi-Camp Pro2 has a sensitive omni-directional 9 dBi antenna, which rceeives the offered WiFi signal. The antenna is designed for outdoor-use, you mount the antenna outside to your mobile home, motorhome or yacht. We recommend to tape the connection between the Omni-antenna and Tube-U(N) with the waterresistant supplied tape. There's antoher main difference between the predecessor and this version. Before the 12V connection cable was optional, with the WiFi-Camp Pro2 it's supplied by default. Using internet hotspots is no problem. You connect the WiFi-Camp Pro2 wifi-extender/router with a hotspot and connect all your devices wireless to the internet. Alfa Network has renewed the chipset, the router software of the R36A is the Linux-based OpenWRT open source software. This software offers programmers, wizzkids and other lovers lots of possibilities to adjust the software, all at own risk. Click the button below to add the Alfa Network CampPro2 Universal WiFi Kit/ Internet Range Extender Kit for Home, Boat, and RVs. to your wish list.